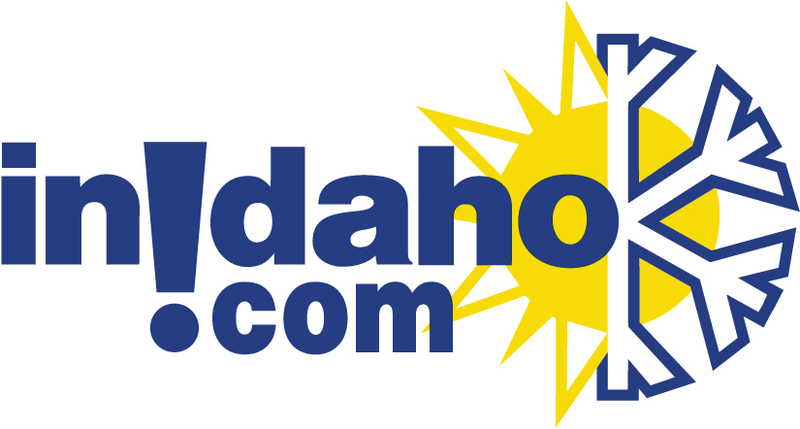 Idaho's high level of geo-thermal activity offers recreationalists with wonderful natural hot springs soaking opportunities. Many natural hot springs in our mountains are remote and not accessible by car. There are books, which can guide you to these gems. We have more information on those in the McCall that are accessible by car. We do not have any current pre-built packages for Hot Springs in the McCall Area . 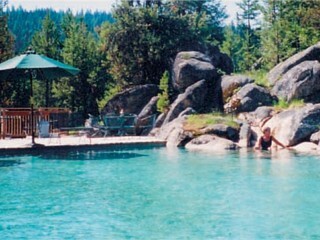 Burgdorf Hot Springs is located 30 miles north of McCall. To get to Burgdorf, go north on Warren Wagon Road from McCall to end of pavement, turn left and go 2 miles. The road is open from about mid-May to late November. During the winter months you can get to Burgdorf either by snowmobile or cross-country ski. Caretakers offer snowmobile shuttle-service for a small fee. Burgdorf dates back to 1862. There are fourteen cabins available for daily rental. The cabins are very rustic with woodstoves, beds, kerosene lamps and outhouses. You would need to bring your own bedding, food, cooking utensils, etc. We call it "camping in a cabin." Pack it in, pack it out - no garbage service. Please bring only biodegradable toiletries. Burgdorf has no electricity. The nearest place to get groceries is McCall, however, we do have a small store with cold drinks and snacks, and some grocery items. 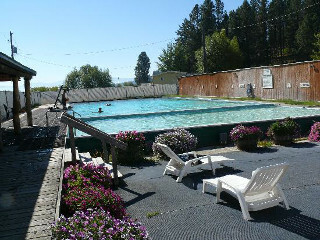 Our large hot springs pool is 50 by 75 feet and has a sand bottom and log sides. It is about 5 feet deep. 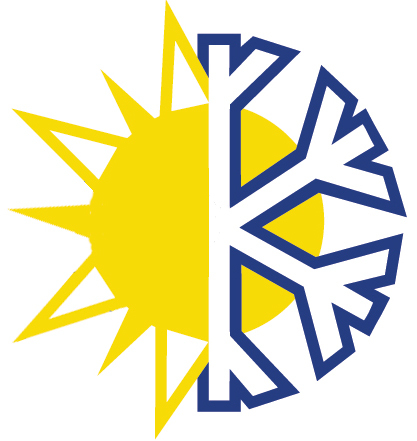 The temperature is approximately 104 degrees at the feed end to about 98º at the outflow end. We have a small children's pool, which is 2 feet deep. We have no lifeguard and there is no diving. Please, no alcohol in or around the pool. The area around Burgdorf is a calving ground for deer, elk and moose, so no pets are allowed. As we do not allow tents, trailers or motor homes in Burgdorf, there are several Forest Service campgrounds in the area. You may check with the Payette National Forest Service in McCall to get information on these campgrounds. There are many trails for hikers, and streams and lakes for fishing. 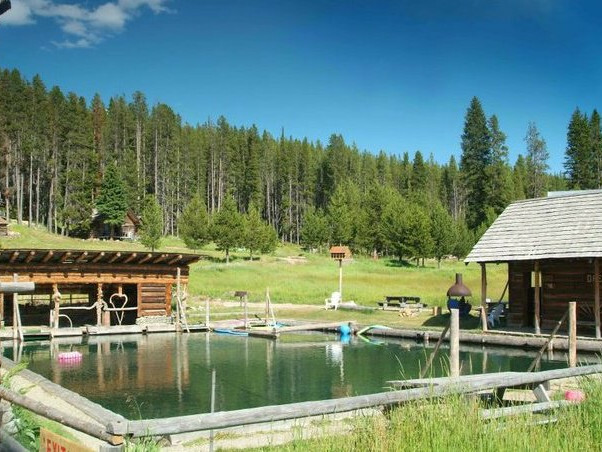 Gold Fork Hot Springs offers 6 chlorine free mineral pools and hydro massage. There is a yurt for changing into your suits, lockers, portable bathrooms, light snacks available, kiddie pools where they can go nuts away from the adults. *The road is narrow at certain places so be very careful of oncoming traffic. It is open year-round, closed Tuesdays for maintenance. Call Toll Free 866-GLD-FORK for hours of operation and directions. OPEN: Noon to 9pm on Sunday, Monday, Wednesday, Thursday and Friday. Noon to 11pm on Saturday only. Closed Tuesdays. No credit or debit cards accepted. Zim's is located 4 miles north of New Meadows on Highway 95. A family facility with picnic and RV camping area, snack bar and showers. Everyone loves to go to Zim's. Enjoy a relaxing soak in the hot pool or a game of basketball in the large pool. Please note: Guest reviews may mention certain amenities that may no longer be offered with Hot Springs in the McCall Area. Please check the amenities prior to booking to confirm. "We loved the hot springs!!" "Very nice hot springs. Clean and water very soothing." "This place hasn't changed in 40 years and that's great! A fun, warm place to spend a few hours in a HOT pool. Great for families. Don't expect anything fancy."